I was just a little guy at the time but what I do remember at such a young age were the anxieties and unknowns of walking into a church for the first time. My parents were wonderful people. Although the surface level we may have appeared to be disheveled and not as put together as those around us, my parents really loved Jesus and knew who they were in Christ. With that being said ,one of the most impressionable aspects of Christ’s church happened to me at a very young age; feeling accepted into the family of God. This act of love, devotion and acceptance has shown me what church family can be. The Church should exemplify love and acceptance like this, to be so in step with the Spirit that we are a place where walls are torn down and reconciliation is made. I believe with a deep conviction that a thorough understanding of the gospel produces actions of real love. If you’ve been at a church for any amount of time, there are things that divide us, in regards to Christian living and ethic, that don’t really matter in light of eternity. 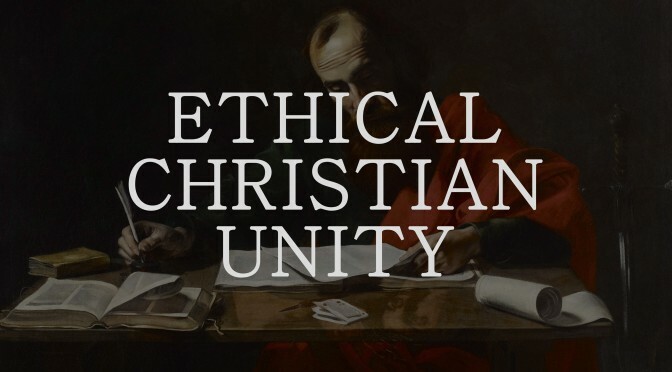 I hope that through the power of the gospel we can understand that Christian unity is the greater good when it comes to open-handed or non-essential issues regarding Christian living, practice and ethic. Stop judging people where you have no place to judge, and accept each other as Christians in open-handed issues of Christian living and ethic, and do everything to the glory of God. As for the one who is weak in faith, welcome him, but not to quarrel over opinions. One person believes he may eat anything, while the weak person eats only vegetables. Let not the one who eats despise the one who abstains, and let not the one who abstains pass judgment on the one who eats, for God has welcomed him. Who are you to pass judgment on the servant of another? It is before his own master that he stands or falls. And he will be upheld, for the Lord is able to make him stand. Paul’s desire is for the strong and weak in faith to set aside secondary issues for the greater good of Christian unity. Paul’s unifying plea to the weak is to not judge the strong and not judge what only God can judge. The Strong: Those understanding the Christian liberty in Christ. Paul’s unifying plea to the strong is to not despise the weak and not exercise such liberties for the sake of love for one another. This chapter is speak of things that a local body needs to work out. This is NOT speaking of denominational doctrinal distinctive. This is talking about you and me disagreeing about petty things and how we must dish out grace to one another for the sake of Christian unity! Out of the two personalities in regard to Christian ethic, which one are you? You accuse the non-intellectual, or the less theologically informed, for not understanding the ‘liberties of a Christian’. Have you considered those you offend? Do you rejoice in your freedom as worship to God? Or do you choose to be haughty and gloat in your freedom? If one grew up in the south and has a conscience, right nor wrong, about the use of alcohol, do you drink in front of them? I sure hope not.You never know if the one thing that is against someone’s conscience may cause them to be put in a place of destitution. Everything you say and do should be to honor the weak. You judge those around for not ‘taking extra’ precaution to live righteously. God is asking you to receive whom he has already received. Why do you continue to question the motives of others, when those motives may not even exist? Do you trust in Christ? Paul would take this a step further by asking, ‘who do you think you are?’ Don’t you know these are your brothers and sister falling under the same banner of grace as you? No one has to prove jack to you, only to the Lord. God is the final judge. Whatever you choose to do, do it to glorify Christ, not yourself. And don’t pass judgment on others who do not live as strict as you, hopefully you do it to worship Christ. If you see the gospel, you must see freedom, and if you see and know the gospel, you must see those you disagree with as being part of your faith family. The implications of the gospel require you to be sharpened by those you disagree with. There is a reason why Paul clarifies his leanings personally by calling ‘the Strong’ as being stronger in faith because it is not in itself sinful to act out our freedom in Christ. Don’t be a Pharisee. You can’t define yourself by what you’re against. THE REMEDY FOR DISUNITY? THE GOSPEL. We need to run to the gospel of Christ every time. Not some of the time, but all the time. How do you view the person across from you? How do you view each other as we sit across from each other in these rooms as we break into small groups? I pray that we view each other with gospel lenses and the mercy of God. Nothing more, nothing less. We must believe that the cross of Christ and His resurrection has changed things. What He did for us has changed how look at our neighbors in Christ. What Paul said in chapter 12 about the renewing of our minds, this is where it takes place by the powerful work of The Spirit. The Weak, whatever you do, do it to the glory of God. If you don’t drink, don’t drink to make yourself appear more religious, rather do it because you choose to worship Jesus with your abstinence, but don’t call another sinful because they have a glass of wine with their steak. The Strong, whatever you do, do to the glory of God. If you like to drink wine with your steak, do it, but not around your brother that is convinced it’s sinful.